When I was a full time elementary school teacher, I remember receiving curriculum from companies. Bic lighters would send writing workbooks. PG&E would send power safety coloring books. I would always toss this marketing propaganda into the recycling bin. Although some of the content was not bad, the company logos all over the curriculum screamed of commercial advertising in education. The Council for Biotechnology Information (CBI) has joined this “educational” marketing strategy attempting to brainwash our kids in favor of their genetically modified organisms (GMO). 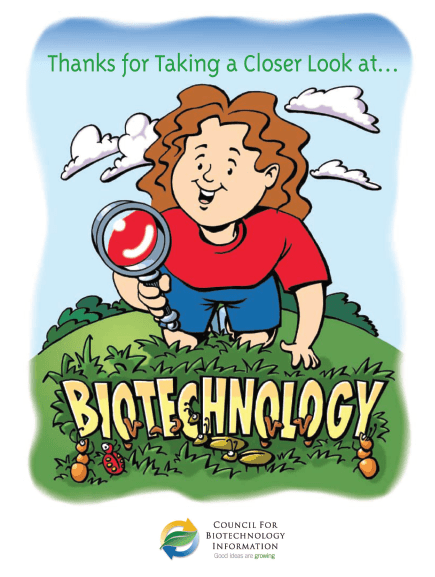 Look Closer at Biotechnology is a coloring book that let’s our kids know how wonderful GMOs are! Welcome to the Biotechnology Basics Activity Book. This is an activity book for young people like you about biotechnology — a really neat topic. Why is it such a neat topic? Because biotech- nology is helping to improve the health of the Earth and the people who call it home. In this book, you will take a closer look at biotechnology. You will see that biotechnology is being used to figure out how to: 1) grow more food; 2) help the environment; and 3) grow more nutritious food that improves our health. As you work through the puzzles in this book, you will learn more about biotechnology and all of the wonderful ways it can help people live better lives in a healthier world. Just who is the Council for Biotechnology Information? CBI members are the leading agricultural biotechnology companies. Unfortunately (but not surprisingly) the book fails to address scientific evidence that Monsanto’s “biotechnology” causes a myriad of health and developmental problems (especially in young children), breeds superweeds, reduces genetic diversity, contaminates the natural gene pool, and requires massive amounts of chemical pesticides, herbicides and fungicides. If this coloring book ever ends up in my children’s classroom as part of the science curriculum, the school board will have their hands full with a very angry parent!